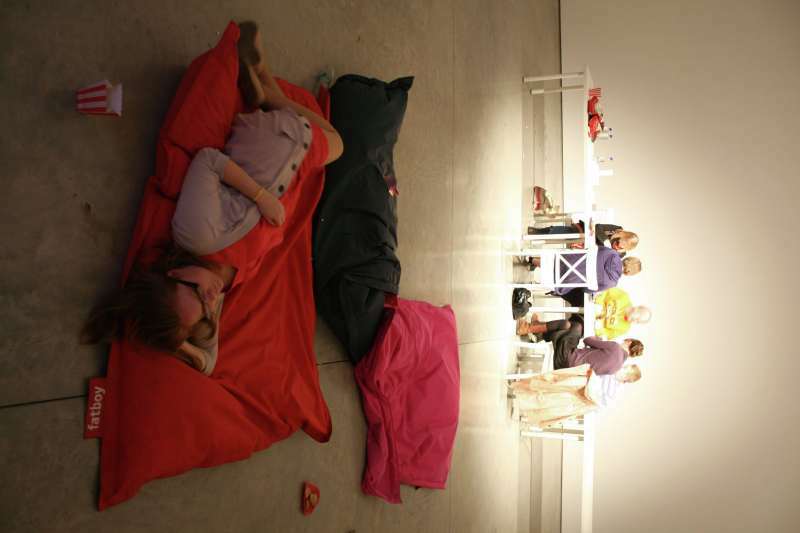 Neva’s practice is collaborative and relational, depending on the participation of the audience and for this performance she advertised in the Nationalist newspaper for participants to join her in making a private process public and collective. She organised the timing of her actions precisely. 2pm – 5.15pm•Film viewing and comfort eating. The table was laid with popcorn and heart shapes biscuits. A screen played two films about love lost and found and large cushions were strewn around the floor. As the audience came into the room they were invited to sit or lie on the cushions, eat popcorn and watch the movies. A song was played on repeat while Neva and participants danced, swayed and lay around. The action moved over to the long table where the badge making began. Badges emblazoned with ‘it’s not me it’s you’ and ‘I will survive’ were produced and worn by all. Neva had long red hair falling down to her shoulder blades as she began this performance. She sat on a chair in the middle of the room for Connie Byrne-Hyland, a professional hairdresser, to cut her hair short and funky. Connie was armed with a cowboy belt full of hairdressing tools and seemed to dance and flutter around Neva as she transformed her. The crowd were both witnessing the event while queuing for their own turn. Bottles of beer were opened and passed around by the newly shorn haired artist. Neva left the tables strewn with empty green beer bottles, cut hair and badges.